I usually don't visit beauty salons for facials and my preference is home facial most of the time. So after deciding to go for home facial, the next job is to find the products that don't cause any issues after usage and do not elevate the present skin issues. 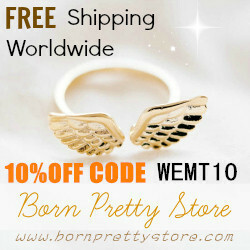 Though my skin is not sensitive, but you never know when a product may hurt the skin. Recently I received a home spa line facial kit from Aryanveda Herbals in Fruit Secret variant. And as usual I read about the brand before proceeding to use the products. Aryanveda Cosmeceuticals blossomed in the year 1997 with a commitment to blend nature with science to perfection and set definitions of quality and deliverability in the field of beauty care products. Aryanveda Herbals is one of those reputed companies which have delivered excellence through ideally formulated herbal cosmetics products of trust-worthy quality. The company has an assimilated experience of more than 17 years of producing fine blends of ayurvedic science & new age cosmetic inventions in skin- safe herbal cosmetic products. The company brings forth a wide range of skin care, body care and hair products to give a complete care to the end-users. 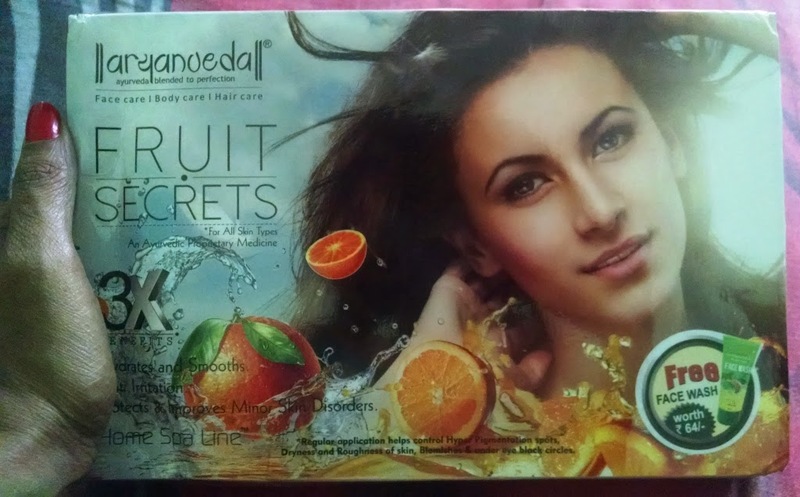 Aryanveda Fruit Secrets Home Spa Line kit comes in a cardboard box. It is a pack of 4 products essential for facial. The complete kit All the products are packaged in squeeze tube that is a great relief. Because I actually dislike the usual sachet packing which has to be finished in single use and cannot be kept safe for later use. 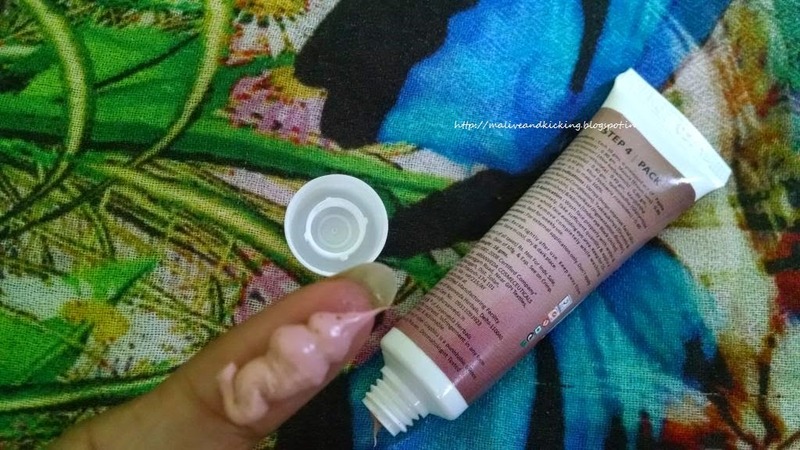 So now I am gonna tell you how these cute tubes actually worked for me.. The tubes have proper numbering done on each as per the sequence in which those should be used. So it makes the job easier. For Step 1. Cleanser: Its an orange color gentle facial which smells absolutely fruity. 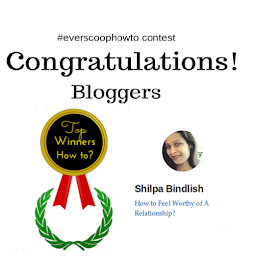 The ingredient list speaks loud of its content that includes papita, shatpatri, tarbooza, kheera, kharbooza, jaitoon oil, gajar etc. 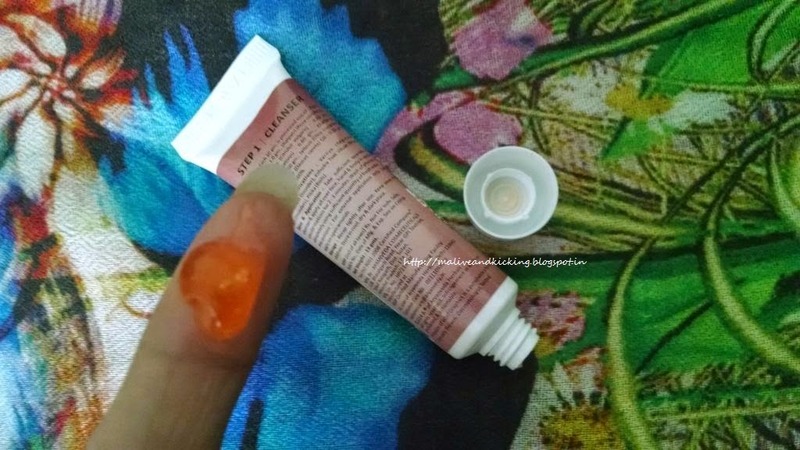 The cleanser resembles like a gel and is transparent. I massaged it gently on my face for few minutes and it seemed to lift the pollutants away from my skin actually. As per the instructions on the tube, I took the generous quantity for massage. But it gets instantly vanished making it lil difficult to give motion to my hands on face. So I used few drops of water to massage and it worked perfectly well. After a massage of less than 5 minutes, I rinsed off my face. 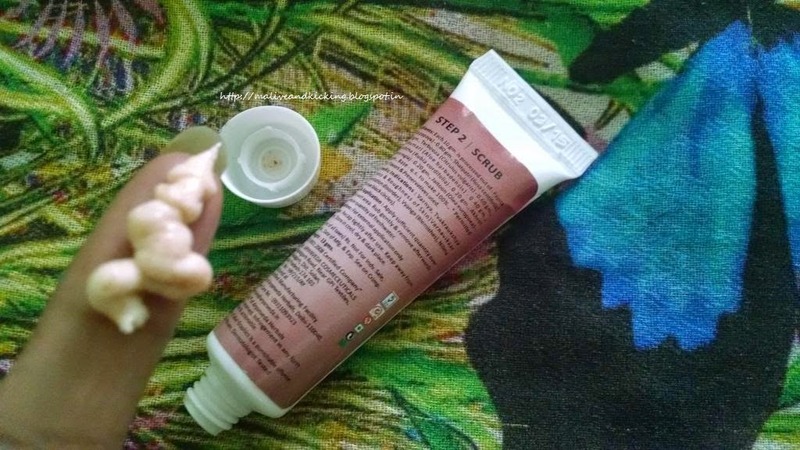 The cleanser comes off quite easily with no need of rubbing. The skin felt deeply cleansed with lovely fragrance. 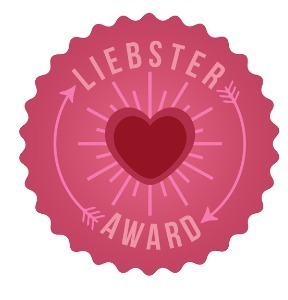 The cleanser did its job really well. And then I took to exfoliate my skin. because the removal of the dead skin cells on the skin's surface is a must for overall face care regimen. 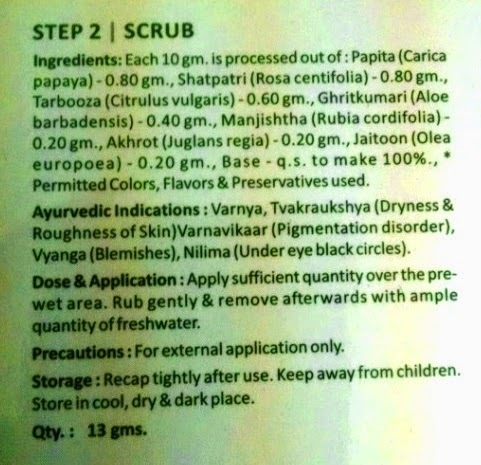 This scrub is infused with papita, shatpatri, tarbooza,ghritkumari, jaitoon oil, manjishtha and akhrot. The scrub is using akhrot among active ingredient which we all know is one of the best exfoliator. This scrub is pale pink color paste. It is too creamy that it doesnt feel like being harsh to skin while scrubbing. The minute akhrot granules are quite gentle for delicate facial skin and remove dead cells successfully. The fragrance of the scrub again is on mild fruity side that doesn't irritate my nose at all. I massaged the scrub on my face and extended it to my neckline as well. It worked even on the tanned areas on my neckline and it appeared cleaner than before. The skin doesn't get over dried, means it retains the natural oils on skin intact. For the optimum benefit of facial, the skin needs a thorough massage after scrubbing. However gentle the scrub may be, but I always feel the soft touch to the skin in the next step. This massage cream is formulated with Ghritkumari, Papita, Kheera, Khus, Badam, Olive oil, Gajar. 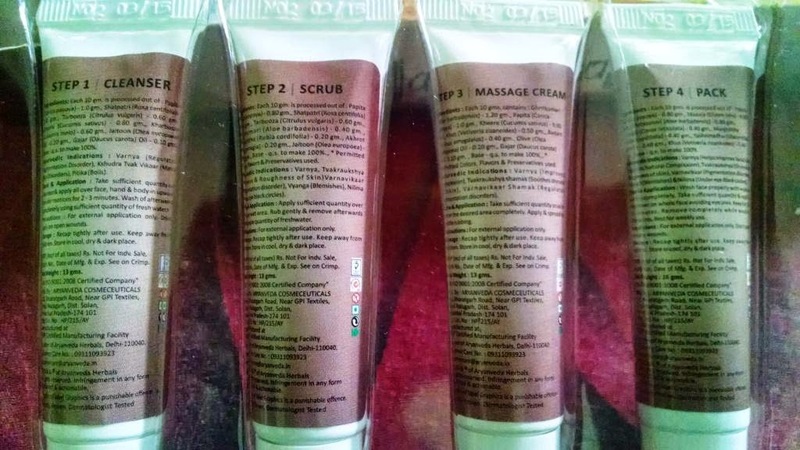 This massage cream is almost similar in color and fragrance as of the scrub. The consistency is not very thick so as you try rubbing it on skin, the fingers glide smoothly on the face. 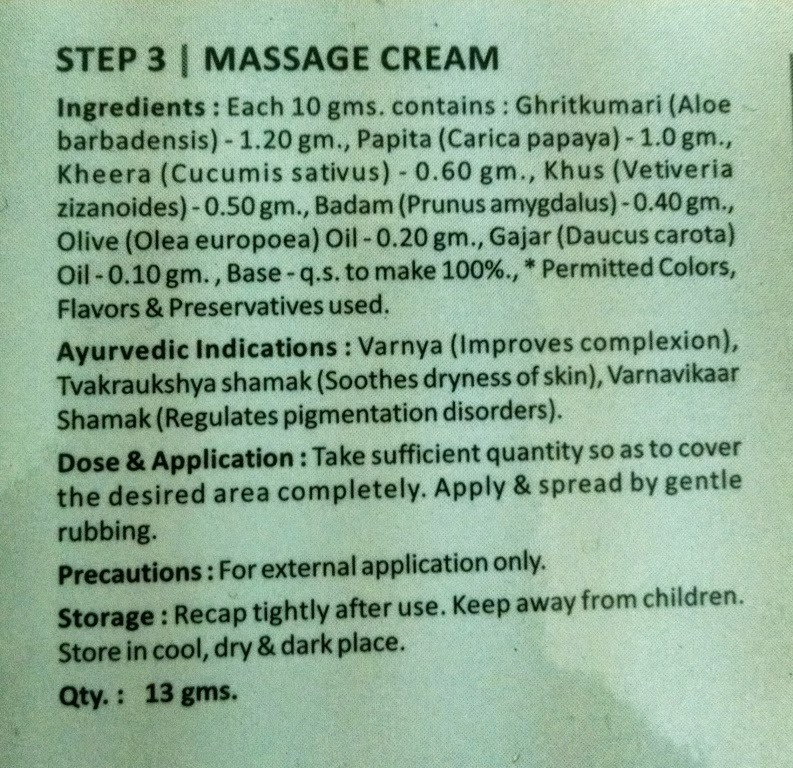 For me it is the appropriate moderate consistency for a massage cream. It penetrates the skin in no time and leaves skin feeling soft, supple and radiant. I didn't notice unwanted shine on my face after its application, and I am really happy about it. A face pack is the final step in facial to moisturise, cleanse, tone and rejuvenate your skin. 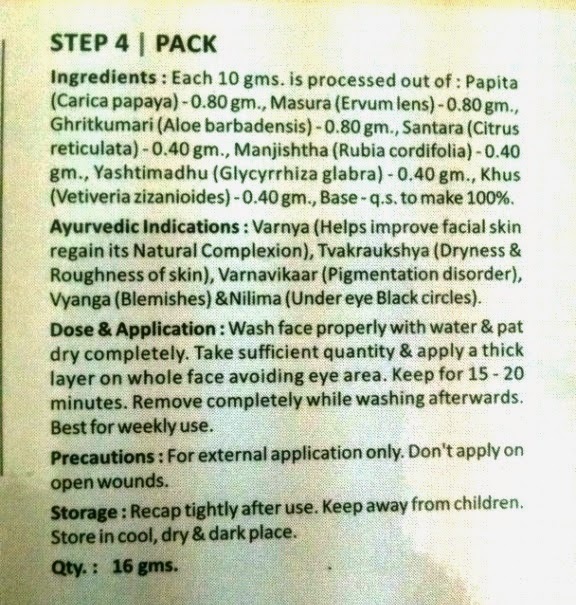 This facepack is made of masura, papita, santara, manjishtha, yashtimadhu, khus, ghritakumari etc. 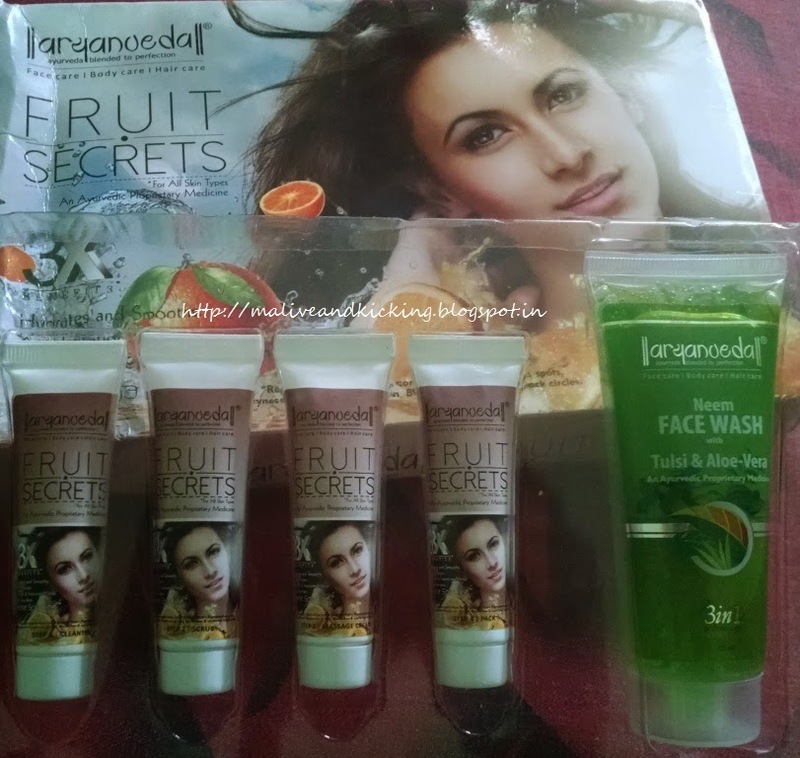 Aryanveda Fruit Secrets Home Spa Line is worth giving a try for a home facial kit that doesn't dig a hole in your pocket and gives impressive results. I just wished the quantity to be little more so that a regular usage can prove its effectiveness visibly. Since I have used it only once and the kit has the enough quantity for one more usage, I expect better result in the next application as I specially loved the natural ingredients used to make the products. 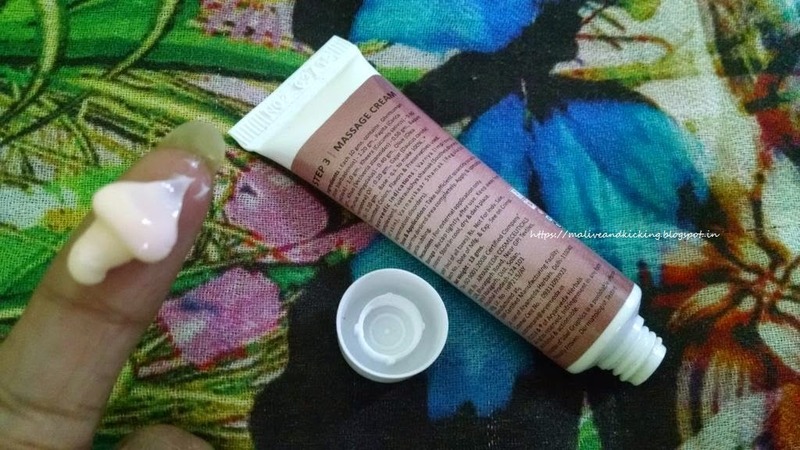 Labels: Aryanveda, Fruit Secrets, Home Spa Line, Review. 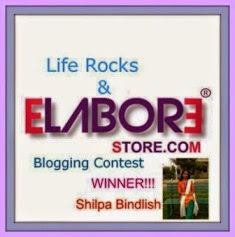 Wow thats a good one Dear...Need to give it a try...Where can i buy it online ? ? That cleanser seems so good. 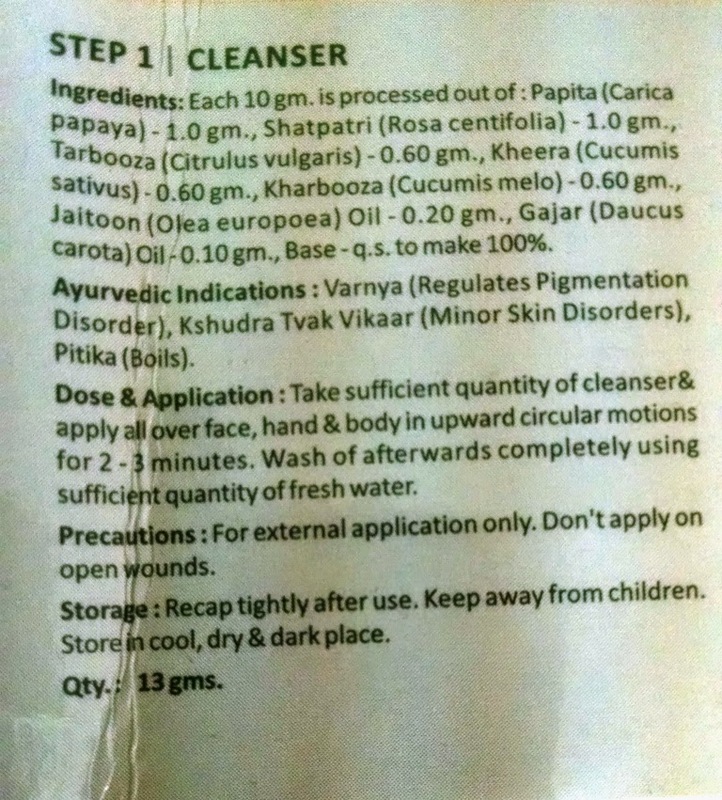 This review tempts me a lot to try out Aryanveda brand. 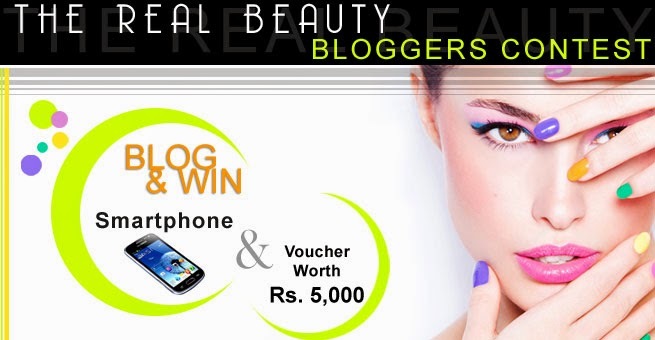 Nice review and within 185/- you get a good facial. Hey, Now 'Fashion' has got personal ! !